The polymerisable compsn. by radiation consists of a 20-80 wt.% polymeric binder soluble in an aq. solution, (b) 0.1-20 wt.% activatable polymerization initiator by the radiation, and (c) 20-80 wt.% (meth)acrylate ester of a polyol with at least two urethane gps. in the molecule. The ester is a reaction prod. of glycerol di(meth) acrylate and a polyisocyanate. The compsn. has a high sensitivity, a long self life, a low volatility, a good reciprocity, good mechanical properties and a low sensitivity to oxygen. 본 발명은 필수성분으로서 중합성 결합제, 방사선에 의해 활성화될 수 있는 중합개시제, 분자내에 적어도 두개의 우레탄 그룹을 갖는 다가 하이드록시 화합물의, 자유라디칼에 의해 중합 가능한 아크릴산 에스테르 또는 메타크릴산 에스테르를 함유하는, 방사선 특히 빛에 의해 중합가능한 조성물에 관한 것이다. The present invention contains a polymeric binder, polyol having at least two urethane groups in the polymerization initiator, a molecule that can be activated by radiation of a hydroxy compound, polymerizable by free radical acrylic acid ester or methacrylic acid ester as essential components , radiation and more particularly to a polymerizable composition by light. 이러한 형태의 조성물은 공지되어 있으며, 인쇄판, 감광성 내식막 및 블록영상 제조에 사용되는 방사선 감수성, 특히 감광성 기록재의 제조에 특히 유효하다. Compositions of this type are well known and are particularly effective in the production of radiation sensitivity, particularly photosensitive recording used in printing plates, photoresists, and the block image production. 독일연방공화국 공개특허공보 제 2,064,079호에는 중합성 화합물로서 적어도 하나의 추가의 유리 하이드록시그룹을 함유하는 다가 알콜의 아크릴산 에스테르 또는 메타크릴산 에스테르, 예를들면, 하이드록시에틸 메타크릴산 에스테르와 디이소시아네이트와의 반응생성물을 함유하는 광중합성 조성물이 기술되어 있다. Federal Republic of Germany Patent Application Publication No. 2064079 discloses at least approaching the one containing more free hydroxy groups of the, for the acrylic acid ester or methacrylic acid ester of an alcohol, such as a polymerizable compound, hydroxyethyl methacrylic acid ester and di the photopolymerizable composition comprising the reaction product of a diisocyanate are described. 이들 조성물은 비교적 취성이 있는 빛-경화 생성물을 형성하는 경향이 있다. These compositions with a relatively brittle light tends to form a cured product. 또한 이들 조성물은 단량체가 약간의 승온에서도 현저한 증기압을 갖기 때문에, 한정된 저장 수명을 갖는다. In addition, because these compositions the monomer has a significant vapor pressure at some temperature increase, and has a limited shelf life. 독일연방공화국 공개특허공보 제 2,361,041호에서는 분자내에 2개이상의 우레탄 그룹 이외에 폴리에테르 단위를 갖는 유사한 중합성 화합물을 함유하는 조성물이 기술되어 있다. In the Federal Republic of Germany Patent Application Publication No. 2361041 has a number of similar compositions containing polymerizable compound having a polyether unit in addition to at least two urethane groups in the molecule is described. 이들 조성물은 한정된 교차 결합 밀도만을 제공하기 때문에 대기 산소에 비교적 민감하다. These compositions are relatively sensitive to atmospheric oxygen, because it provides only limited crosslink density. 독일연방공화국 공개특허공보 제 2,822,190호에는 특정 목적을 위해, 예를들어 건조상태로 이동될 수 있는 감광성 내식막층 제조를 위해 다수의 장점을 갖고 있는 우레탄 그룹을 함유하는 고분자량 단량체와의 조성물이 기술되어 있다. Federal Republic of Germany Patent Application Publication No. 2.82219 million heading for a specific purpose, for example the composition of a high molecular weight monomer containing a urethane group with a number of advantages for producing a photoresist film that can be moved to a dry technology It is. 그러나, 이러한 조성물도 분자량단위당 중합성 그룹의 함량이 낮기 때문에 한정되 교차결합밀도를 갖는 생성물을 제공한다. However, providing a product having a cross-link density are limited because such a composition is also a low molecular weight content of the polymerizable group per unit. 미합중국 특허 명세서 제 3,850,770호 및 제 4,198,238호 및 유럽 공개특허공보 제 9,967호에는 유사한 중합성 올리고우레탄이 기술되어 있다. U.S. Patent Specification No. 3.85077 million and No. 4198238 and No. EP-A-9967 discloses a similar oligonucleotide polymerizing the urethane art. 이러한 중합성 화합물로 제조된 및 감수성 또는 방사선-감수성 기록재는 탁월한 특성을 갖고 있으나 이러한 특성은 대부분의 경우에 특정한 단점을 수반하게 된다. This is made of a polymerizable compound and a sensitivity or radiation-sensitive recording material having excellent properties, but these properties are accompanied by certain disadvantages in many cases. 따라서, 폴리에테르 그룹을 함유하는 고분자량의 올리고우레탄이 노출된 상태와 노출되지 않은 상태에서 우수한 기계적 특성을 갖는 층을 제공하더라도, 이러한 물질에서 수득되는 교차결합 밀도는 특정한 저분자량 단량체의 경우에서 보다 낮다. Therefore, even if the raising of the high molecular weight containing a polyether group, a urethane to provide a layer with good mechanical properties in the unexposed and exposed states, cross-link density obtained in these materials than in the case of certain low-molecular weight monomer low. 다수의 단량체, 특히 수용성/알칼리성 매체에서 현상될 수 있는 바람직한 결합제와 결합된 단량체는 점성층을 제공한다. The monomer combined with the preferred binding agent which may be developed in a number of monomers, in particular aqueous / alkaline medium provides a viscous layer. 또한, 공지 물질은 거의 모두 대기 산소에 대한 감수성이 바람직한 것보다 더 크다. In addition, the known material is greater than substantially all of the sensitivity to atmospheric oxygen preferred. 본 발명의 목적은 방사선에 의해 중합이 가능하고 방사선에 대해 감수성이 높으며 결정화하려는 경향이 없으나, 그럼에도 불구하고 비점성 표면을 갖는 층을 제공하는 조성물을 제공하는데 있다. An object of the present invention to, but tend to be a polymerized by radiation and has high crystallization susceptibility to radiation, and yet provides a composition for providing a layer having a non-tack surface. 특히, 조성물은 대기산소 존재하에 유익한 특성, 즉 산소-억제 차단층이 없이 현상되어야 하기 때문에 가능한한 우수한 상반성을 나타내야 한다. In particular, the composition is beneficial properties, i.e., oxygen in the atmosphere of oxygen present - should exhibit a good reciprocity possible because they must be developed without inhibiting barrier layer. 본 발명의 주제는 방사선에 의해 중합이 가능하고 필수성분으로서 중합성 결합제, 방사선에 의해 활성화 될 수 있는 중합개시제 및 분자내에 적어도 두개의 우레탄 그룹을 갖는 다가 하이드록시 화합물의 아크릴산 에스테르 또는 메타크릴산 에스테르를 함유하는 조성물이다. Subject of the invention is at least two polyvalent hydroxyl compound in the acrylic acid ester or methacrylic acid ester having a urethane group in the polymerization initiator, and molecules that polymerization is possible and enabled by the polymeric binding agents, radiation, as an essential component by radiation a composition containing a. 본 발명의 조성물은 상기 에스테르가 글리세롤 디메타크릴산 에스테르 또는 글리세롤 디아크릴산 에스테르와 2 내지 6개의 OH그룹을 갖는 다가 하이드록시 화합물을 디이소시아네이트와 반응시켜 수득된 폴리이소시아네이트와의 반응생성물, 또는 글리세롤 디메타크릴산 에스테르 또는 글리세롤 디아크릴산 에스테르와 디이소시아네이트와의 반응 생성물임을 특징으로 한다. The compositions of the present invention the ester is glycerol di-methacrylate ester or glycerol di-acrylate ester and 2 to 6 hydroxy compound polyvalent having OH groups diisocyanate and reacting the reaction product of the obtained polyisocyanate, or glycerol di It characterized in that methacrylic acid esters or acrylic acid esters and glycerol di-diisocyanate and the reaction product of. 다가 하이드록시 화합물은 OH 그룹이 2 또는 3개, 특히 2개인 것이 바람직하며, 다음 일반식을 갖는 화합물이 바람직하다. Polyhydric hydroxy compound is 2 or 3 OH groups, particularly preferably 2, and individuals, the following compounds having the following general formula are preferred. 상기식에서, R"는 O, S, CR 2 또는 SO 2 이고, Q는 페닐렌그룹 또는 C q H 2q 또는 C q H 2q-2 그룹이며, R은 수소원자 또는 메틸그룹이고, Z는 0 또는 NR이며, n은 0 내지 20의 정수이고, m은 1 내지 40의 정수이며, p는 2 내지 20의 정수이고, q는 2 내지 10의 정수이며, r은 4 내지 20의 정수이고, s는 2 내지 10의 정수이며, v는 0 내지 4의 정수이고, p, q 및 s는 v보다 2이상이 크며 r은 v보다 4이상이 크다. And wherein R, R "is O, S, CR 2, or SO 2, Q is a phenylene group or a C q H 2q or C q H 2q-2 group, R is a hydrogen atom or a methyl group, Z is O or NR a, n is an integer from 0 to 20, m is an integer from 1 to 40, p is an integer from 2 to 20, q is an integer from 2 to 10, r is from 4 to 20, an integer, s is an integer of from 2 to 10, v is an integer from 0 to 4, p, q and s is greater than v 2 r is greater than 4 or more than v.
일반적으로, 디이소시아네이트는 일반식 OCN-X-NCO(여기서, X는 탄화수소라디칼, 특히 탄소수 2 내지 20의 포화 지방족 또는 지환족 탄화수소라디칼이다)의 화합물이다. In general, the diisocyanate is a compound represented by the general formula OCN-X-NCO (where, X is a hydrocarbon radical and particularly a saturated aliphatic or cycloaliphatic hydrocarbon radical of 2 to 20 carbon atoms). 글리세롤 디메타크릴산 에스테르의 반응생성물은 통상적으로 글리세롤아크릴산 에스테르의 반응생성물보다 바람직하다. Reaction products of glycerol di-methacrylate ester is typically preferable than the reaction product of acrylic acid ester of glycerol. 다가 하이드록시화합물과 디이소시아네이트를 반응시켜 수득된 폴리이소시아네이트는 분자당 평균 2 내지 40개, 특히 2 내지 20개의 메탄그룹을 함유한다. Polyhydric obtained by reacting a hydroxy compound with a diisocyanate polyisocyanates should contain an average of from 2 to 40 per molecule, preferably 2 to 20 methane group. 적어도 단파장가시광선의 에너지에 상응하는 에너지를 갖는 방사선이면 본 발명이 조성물을 민감하게 만드는 전자기방사선으로 적합하다. If the at least radiation having an energy corresponding to the short wavelength of visible light energy is suitable electromagnetic radiation makes the present invention sensitive to the composition. 300 내지 500nm의 광파장이 바람직하나, X-선, 전자방사선, 미립자방사선 및 레이저 방사선도 중합화를 개시하는데 적합하다. Light wavelength of 300 to 500nm is preferably one, X- ray, electromagnetic radiation, particulate radiation and the laser radiation is suited to initiate the polymerization. 특정한 경우에, 개시제 시스템을 공지된 방법으로 원하는 방사선에 적합하게 하거나 또는 이방사선에 민감하게 할 수 있다. In certain cases, it may be adapted to the desired radiation in a known way the initiator system sensitive to the anisotropic or diagonal. 중합화할 수 있는 우레탄을 제조하는데 사용되는 폴리올 성분으로는 폴리에테르 폴리올, 특히 포화된 화합물, 즉 일반식 HO-[C p H 2p-v (OH) v -O-] m H의 화합물이 바람직하다. A polyol component used to prepare the polyurethane that can be polymerized is a polyether polyol, especially a saturated compound, or by the general formula HO- [C p H 2p-v (OH) v -O-] m H compounds are preferred . P 값은 2 내지 10, 특히 2 내지 4가 바람직하다. P values ​​are 2 to 10, especially 2 to 4 is preferred. 불포화된 폴리올을 사용할 경우, 이들 폴리올은 폴리올단위당 4 내지 10개의 탄소원자를 갖는 것이 바람직하다. When using an unsaturated polyol, these polyol is preferably a polyol having from 4 to 10 carbon atoms per unit. 특정한 목적, 예를들면 특정한 기계적 특성 또는 높은 광민감성을 얻기 위하여는, 폴리에스테르 폴리올을 사용하는 것이 유익할 수 있다. To achieve a specific purpose, for example a specific mechanical properties or high light sensitivity, can be beneficial to use the polyester polyol. 이들은 공지된 방법으로 디카복실산 단위와 폴리올단위, 또는 하이드록시카복실산 단위들로 부터 합성할 수 있다. It can be synthesized from the dicarboxylic acid unit and a polyol unit, or a hydroxycarboxylic acid unit in a known manner. 여기에서는 q=3 내지 6을 갖는 하이드록시카복실산이 바람직하다. In this case the hydroxy carboxylic acid having q = 3 to 6 is preferred. 하이드록시카복실산으로 부터 합성된 폴리에스테르디올은 통상적으로 H-활성 화합물 HO-C s H 2s -ZH 분자로 개환시켜 락톤으로 부터 제조된다. Hydroxycarboxylic acid synthesized from a polyester diol is typically by the ring-opening to the H- active compound HO-C s H 2s -ZH molecule is prepared from the lactone. 이 화합물에서는 S는 바람직하게는 2 내지 6의 값을 가지며, Z는 바람직하게는 산소원자이다. This compound S preferably has a value of from 2 to 6, Z is preferably an oxygen atom. 폴리에스테르 디올과 폴리에테르 디올의 단위수는 이들 화합물의 특성과 분자의 잔여 단위, 결합제의 특성과 목적하는 용도에 좌우된다. Poly number of units of an ester diol and polyether diol is dependent on the nature and intended use of the remaining components of the binder characteristic of these compounds and molecules. 분자내에 비교적 긴 폴리옥시에틸렌 쇄를 갖고 있는 중합가능한 화합물은 매우 친수성이 크며 수용성 현상액으로 쉽게 현상된다. Polymerizable compounds having a relatively long polyoxyethylene chain in a molecule is large and a very hydrophilic readily soluble in the developing solution developed. 친수성이 적은 결합제를 사용할 경우에도, 폴리에테르 그룹을 갖는 단량체는 일반적으로 매우 적합하다. Even when using the less hydrophilic binder, a monomer having a polyether group is generally very suitable. 이와 대조적으로, 고급 알킬렌라디칼을 갖는 폴리옥시알킬렌 그룹 또는 폴리에스테르그룹을 함유하는 단량체의 경우에, 현상액에 유기용매를 가하지 않고 물질을 현상시키기 위하여는 친수성이 더 큰 결합제를 사용하는 것이 필요하다. In contrast, with a higher alkyl alkylene radical polyoxyalkylene group or polyester group in the case of the monomer, to use a larger binder is hydrophilic so as to develop the material without adding an organic solvent in the developer is required to contain Do. 대부분의 경우에 m=2 내지 25, 특히 3 내지 15를 갖는 화합물이 바람직하다. A compound having m = 2 to 25, especially 3 to 15 in most cases is preferred. 적합한 디이소시아네이트의 예는 톨일렌 디이소시아네이트, 크실일렌 디이소시아네이트, 나프틸렌 디이소시아네이트, 헥사메틸렌 디이소시아네이트, 사이클로헥실렌 디이소시아네이트, 디페닐메탄 디이소시아네이트, 이소포론 디이소시아네이트, 2,2,4-트리메틸 헥사메틸렌 디이소시아네이트 및 2몰의 톨일렌 디이소시아네이트 또는 디페닐메탄 디이소시아네이트와 1몰의폴리테트라하이드로푸란의 반응생성물이다. An example of a suitable diisocyanate is tolyl diisocyanate ylene, keusil ylene diisocyanate, naphthylene diisocyanate, hexamethylene diisocyanate, cyclohexylene diisocyanate, diphenylmethane diisocyanate, isophorone diisocyanate, 2,2,4-trimethyl hexamethylene diisocyanate and the reaction product of 2 moles of tall ylene diisocyanate or diphenylmethane diisocyanate with one mole of the poly-tetrahydrofuran. 적합한 단량체성 또는 중합체성 디올의 예는 에틸렌 글리콜, 프로필렌 클리콜, 1,4-부탄디올, 2-에틸-1,6-헥산디올, 1,10-데칸디올, 1,4-비스-하이드록시메틸사이클로헥산,디에틸렌글리콜, 트리에틸렌글리콜, 분자량 200 내지 약 1500의 폴리에틸렌글리콜, 및 4,4'-디하이드록시-디페닐에테르, 4,4'-디하이드록시-디페닐 설파이드, 4,4'-디하이드록시-디페닐메탄, 4,4'-디하이드록시-디페닐프로판 또는 4,4'-디하이드록시-디페닐설폰과 0 내지 40몰의 알킬렌 옥사이드, 폴리프로필렌 글리콜, 폴리테트라하이드로푸란, 폴리부틸렌글리콜, 티오디에틸렌글리콜 및 디티오트리에틸렌 글리콜과의 반응 생성물이다. Examples of suitable monomeric or polymeric diols include ethylene glycol, propylene glycol, 1,4-butanediol, 2-ethyl-1,6-hexanediol, 1,10-decanediol, 1,4-bis-hydroxymethyl- cyclohexane, diethylene glycol, triethylene glycol, with a molecular weight of 200 to 1500 polyethylene glycol, and 4,4'-dihydroxy-diphenyl ether, 4,4'-dihydroxy-diphenyl sulfide, 4,4 '- dihydroxy-diphenylmethane, 4,4'-dihydroxy-diphenyl propane, or 4,4'-dihydroxy-diphenyl sulfone and alkyl of 0 to 40 mol alkylene oxide, polypropylene glycol, tetrahydrofuran, and the reaction product of polybutylene and butylene glycol, thiodiethylene glycol, triethylene glycol dithio. 적합한 폴리에스테르 성분의 예는 폴리카프로락톤, 폴리부티로락톤, 폴리에틸렌 테레프탈레이트, 폴리프로필렌 아디페이트, 폴리부틸렌 아디페이트 및 폴리에틸렌부틸렌 세바케이트이다. Examples of suitable polyester component is a polycaprolactone, a lactone to the polyester butynyl, polyethylene terephthalate, polypropylene adipate, polybutylene adipate and polyethylene butylene sebacate. 약 500 내지 3000 범위의 분자량을 갖는 폴리에스테르 폴리올이 일반적으로 매우 적합하다. The polyester polyol has a molecular weight of about 500 to 3,000 range is generally very suitable. 바람직한 디올과는 별도로, 2 내지 6의 지방족 하이드록시그룹을 갖는 화합물이 일반적으로 사용될 수 있다. Preferred diols and separately, it may be a compound having an aliphatic hydroxy group of 2 to 6 to be used in general. 단량체성 화합물의 예는 글리세롤, 트리메틸올 프로판, 펜타에리트리톨, 디펜타에리트리톨, 및 소르비톨이다. Examples of the monomeric compounds are glycerol, trimethylolpropane, pentaerythritol, dipentaerythritol, and sorbitol. 적합한 중합체성 다가 하이드록시 화합물은 미합중국 특허 명세서 제 3,169,945호에 기재된 락톤 폴리에스테르와 같은 폴리에스테르 폴리올, 미합중국 특허명세서 제 3,641,199호에 기재된 말단 하이드록시그룹을 갖는 폴리에스테르 축합중합체, 미합중국 특허명세서 제 3,931,117호에 기재된 하이드록시 그룹 함유 폴리에스테르, 폴리에테르와 말단 하이드록시 그룹을 갖는 폴리에스테르와의 블럭 공중합체, 카프로락톤 폴리올 및 폴리실옥산 폴리올이다. Suitable polymeric polyvalent hydroxy compounds are United States patent specification No. 3,169,945 a polyester condensation polymer, the United States patent specification No. 3,931,117 No. lactone described in arc having a terminal hydroxy group as described for the polyester polyols, the United States patent specification No. 3,641,199 arc, such as polyester hydroxy group-containing polyesters, polyethers with terminal hydroxy block copolymers, polycaprolactone polyol and a polyester having a group and a poly yarn according to the siloxane polyol. 중합가능한 디우레탄 또는 폴리우레탄의 제조는 그 자체 공지된 방법, 예를들면 미합중국 특허명세서 제3,297,745호, 독일연방공화국 공개특허공보 제 2,064,079호 및 제 2,822,190호에는 기재된 방법으로 수행한다. Preparation of polymerizable di-urethane or polyurethane is carried out in per se known method, for example, U.S. Patent Specification No. 3,297,745 first, Federal Republic of Germany Laid Open Patent No. 2,064,079 and No. 2.82219 million heading methods described. 글리세롤 디에스테르를 제조하기 위해, 1몰의 글리시딜 아크릴산 에스테르 또는 글리시딜 메타크릴산 에스테르를 1몰의 아크릴산 또는 메타크릴산과 먼저 반응시킨다. For the production of glycerol di-ester, glycidyl acrylate or glycidyl ester of methacrylic acid or methacrylic acid and one mole of the methacrylic acid ester is first reaction of 1 mol. 이 반응생성물 1몰과 1당량의 폴리 이소시아네이트를 반응시킨다. This reaction product is reacted with one mole of polyisocyanate 1 eq. 이 공정에서, 폴리이소시아네이트, 바람직하게는 디이소시아네이트는 폴리올성분과 과량의 단량체성 디이소시아네이트와의 단량체성 또는 반응생성물이다. In this process, a polyisocyanate, preferably a diisocyanate is a monomeric or a reaction product of a polyol component with an excess of monomeric diisocyanates. 후자의 경우에, 폴리올성분은 목적하는 과량의 디이소시아네이트와 먼저 반응시킨다. In the latter case, the polyol component is first reacted with an excess of diisocyanate that purpose. 대개, 이에 의해 중합체 균질 혼합물이 얻어진다. Typically, this polymer is a homogeneous mixture is obtained. 이로부터 수득된 단량체들의 분자량의 불균일성은 매우 점도가 높고 실질적으로 비결정성인 제품을 야기시킨다. Non-uniformity of the molecular weight of the monomer obtained therefrom has a high viscosity so substantially as to cause amorphous product. 상술한 신규의 단량체이외에, 분 발명의 조성물은 총 단량체 함량에 비하여 임의로 우레탄 그룹을 함유할 수 있는 다가 알콜의 아크릴산 에스테르 또는 메타크릴산 에스테르와 같은 공지의 단량체 50%미만, 바람직하게는 20%미만의 소량을 함유할 수 있다. In addition to the monomers of the above-described novel composition of minute invention is less than 50% monomers of known, such as optionally polyhydric alcohols acrylic acid ester or methacrylic acid ester of which may contain a urethane group compared to the total monomer content, preferably less than 20% a small amount can be contained. 중합가능한 화합물의 총량은 일반적으로 조성물의 비휘발성 성분의 20 내지 80, 바람직하게는 30 내지 70중량%이다. The total amount of polymerizable compounds is generally from 20 to 80, preferably 30 to 70% by weight of the nonvolatile components of the composition. 광개시제로서 적합선 물질은, 예를들면, 벤조인, 벤조인 에테르, 2-에틸-안트라퀴논과 같은 폴리뉴클리어 퀴논, 9-페닐-아크리딘, 9-p-메톡시페닐-아크리딘, 9-아세틸아미노-아크리딘 및 벤즈아크리딘과 같은 아크리딘 유도체, 9,10-디메틸-벤즈펜아진, 9-메틸-벤즈펜아진 및 10-메톡시-벤즈펜아진과 같은 펜아진유도체, 6,4',4"-트리메톡시-2,3-디페닐-퀴녹살린 및 4',4"-디메톡시-2,3-디페닐-5-아자-퀴녹살린과 같은 퀴녹살린유도체, 및 퀴나졸린 유도체이다. Line material suitable as photoinitiators are, for example, benzoin, benzoin ether, 2-ethyl-anthraquinone ketones such clear poly New Synthesis of 9-phenyl-acridine, 9-p- methoxyphenyl-acridine , 9-acetylamino-acridine and acridine benzamide and like acridine derivatives, 9,10-dimethyl-benzamide phenazine, 9-methyl-benzamide phenazine and 10-methoxy-benzamide as a pen, such as phenazine triazine derivatives, 6,4 ', 4 "- trimethoxy-2,3-diphenyl-quinoxaline and 4', 4" - dimethoxy-2,3-diphenyl-5-aza-quinoxaline quinoxaline, such as saline It is utilized derivatives, and quinazoline derivatives. 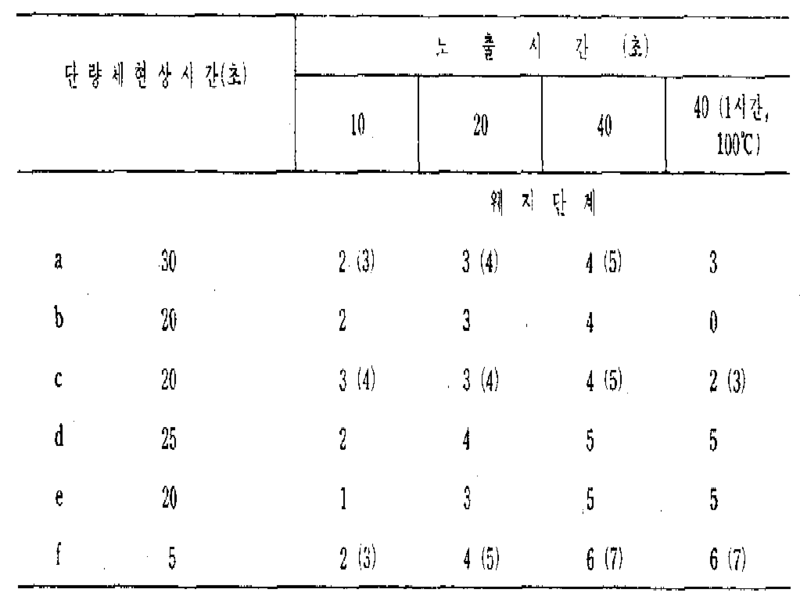 일반적으로 광개시제는 광주합성 조성물의 비휘발성 성분에 대하여 0.1 내지 20중량%의 양을 가한다. Generally, the photoinitiator is an amount of 0.1 to 20% by weight relative to the nonvolatile components of Guangzhou composition. 결합제로서 다수의 용해성 유기중합체를 사용할 수 있다. It can be used a number of soluble organic polymer as binder. 다음의 것들이 사용될 수 있다 : 폴리아미드, 폴리비닐 에스테르, 폴리비닐아세탈, 폴리비닐 에테르, 폴리아크릴산 에스테르, 폴리메타크릴산 에스테르, 폴리에스테르, 알키드수지, 폴리아크릴아미드, 폴리비닐알콜, 폴리에틸렌옥사이드, 폴리디메틸아크릴아미드, 폴리비닐피롤리돈, 폴리비닐메틸포름아미드, 폴리비닐 메틸아세트아미드, 및 기재된 호모중합체를 형성하는 단량체들의 공중합체. It can be used following ones of: polyamides, polyvinyl esters, polyvinyl acetal, polyvinyl ether, polyacrylic acid ester, polymethacrylic acid ester, polyester, alkyd resin, polyacrylamide, polyvinyl alcohol, polyethylene oxide, poly a copolymer of dimethyl acrylamide, polyvinyl pyrrolidone, polyvinyl methyl formamide, polyvinyl methyl acetamide, and the monomer to form a homopolymer described. 젤라틴 및 셀룰로오스 에테르와 같은 천연 또는 개질된 천연물질도 또한 결합제로서 적합하다. Also natural or modified natural substances, such as gelatin and cellulose ethers also are suitable as binders. 특히 사용하기에 유리한 결합제는 이 결합제를 갖는 층들이 바람직한 수성/알칼리성 현상액으로 현상될 수 있기 때문에, 수성/알칼리성 용액중에서 용해하거나 또는 적어도 팽윤가능한 것이다. Particularly advantageous binders for use, since it can be developed in the layers are preferred aqueous / alkaline developer having a binding agent, is soluble or at least swells in aqueous / alkaline solutions. 이러한 종류의 결합제는 예를들면 -COOH, -PO 3 H 2 , -SO 3 NH 2 , -SO 2 -NH-CO등의 그룹을 함유하고 있다. 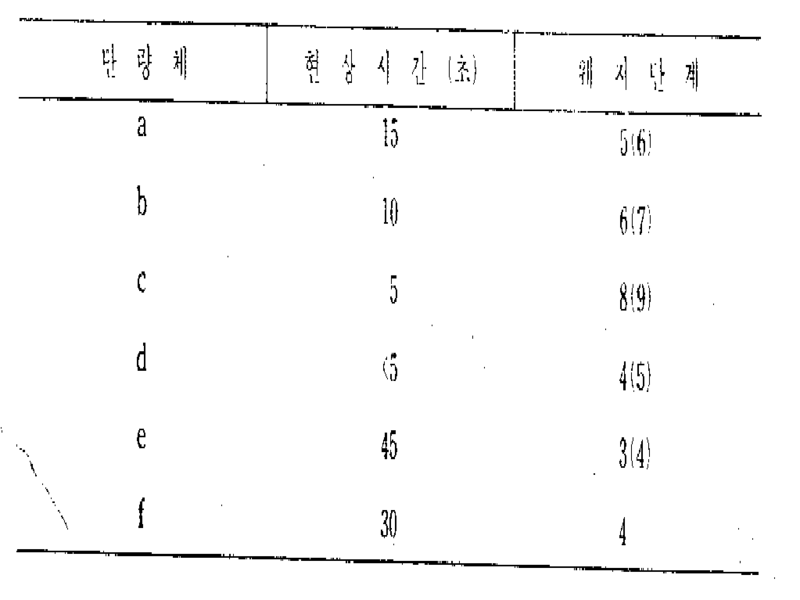 These types of binders are, for example, contain a group, such as -COOH, -PO 3 H 2, -SO 3 NH 2, -SO 2 -NH-CO. 다음의 결합제를 예로서 언급할 수 있다 : 말레이네이트 수지, β-메타크릴로일옥시-에틸-N-(p-톨일-설포닐)-카바메이트의 중합체 또는 이중합체 및 유사한 단량체와 다른 단량체와의 공중합체, 스티렌/무수말레산 공중합체, 메틸비닐에테르와 무수말레산 또는 말레산 에스테르 또는 반에스테르와의 공중합체, 메틸메타크릴산 에스테르/메타크릴산 공중합체 및 메타크릴산, 알킬메타크릴산 에스테르 및 메틸 메타크릴산 에스테르 및/또는 스티렌, 아크릴로니트릴 등과의 공중합체[참조: 독일연방공화국 공개특허공보 제 2,064,080호 및 제 2,363,806호]. Mention may be made of the following binding agents as for example, carbonate maleimide resin, β- methacryloyl-yloxy-ethyl -N- (p- tolyl-sulfonyl) carbamate of the polymer or copolymer and a double similar monomers with other monomers and of the copolymer, a styrene / maleic anhydride copolymer, methyl vinyl ether and maleic anhydride or maleic acid ester or a copolymer of methyl methacrylate with a half-ester acid ester / methacrylic acid copolymer, and methacrylic acid, alkyl methacrylate acid methyl ester and methacrylic acid esters and / or styrene, copolymers of acrylonitrile as the reference: federal Republic of Germany Patent Application Publication No. 2363806 and No. 2.06408 million call. 스티렌과 무수말레산 또는 말레산 에스테르 또는 반 에스테르와의 공중합체가 임의로 메틸비닐에테르와 말레산 반 에스테르와의 공중합체와 결합된 것이 특히 바람직하다. It is a copolymer of styrene and maleic anhydride or maleic acid esters or half-esters, optionally combined with a copolymer of methyl vinyl ether and maleic acid half ester is particularly preferable. 일반적으로, 결합제의 양은 조성물 성분의 20 내지 80중량%, 바람직하게는 30 내지 70중량%이다. In general, a 20 to 80% by weight of the amount of binder composition components, preferably 30 to 70% by weight. 단량체, 결합제 및 광개시제 이외에, 광중합성 조성물은 이의로 암중량단량체의 중합화를 방지하기 위한 안정화제 또는 개시제, 수소공여제, 습윤제, 가소제, 감도측정조절제, 염료 및 무색안료 또는 착색안료를 함유한다. In addition to a monomer, a binder and a photoinitiator, the photopolymerizable compositions contain a stabilizer or initiator, a hydrogen donating agent, a wetting agent, a plasticizer, a sensitivity measurement adjusting agent, a dye and a colorless pigment or a coloring pigment to prevent the polymerization of the arm weight monomers thereof . 수소공여제로는 지방족 폴리에테르가 사용된다. Hydrogen donating agent is an aliphatic polyether is used. 이러한 물질이 불안정한 수소 원자를 가질 경우, 이러한 기능은 결합제 또는 중합성 단량체에 의해 임의로 취해질 수 있다. If such a material having a labile hydrogen atom, such a function can be taken randomly by the binder or the polymerizable monomer. 광중합화 동안 대기산소의 작용에 의한 조성물로 부터 제조되는 광중합성 복사물질의 광중합성층을 제거하는 것, 즉 특히 대기산소가 층으로 확산되는 것을 방지하는 것이 유리할 수 있다. The removal of the photo-polymerization layer of the photopolymerization photopolymerizable copying material produced from the composition by the action of atmospheric oxygen for, that is it may be advantageous to prevent in particular atmospheric oxygen are diffused into layers. 예를 들어 투사에 의하여 또는 레이저 광선에 의하여 노출된 경우에 공정이 진공 복사프레임 없이 수행되면, 이러한 것이 특히 중요하다. For example, if the process in the case by a projection or by the laser beam exposure, without performing the vacuum copying frame, this is not particularly important. 조성물이 얇은 복사층의 형태로 사용되면, 산소에 대하여 낮은 침투성을 갖는 적합한 보호필름을 사용하는 것이 유리하다. When the composition is used in the form of a thin copying layer, the use of a suitable protective film having a low permeability with respect to oxygen is advantageous. 이것은 자급할 수 있으며 복사층의 현상전에 제거할 수 있다. This can be self-sufficient and can be removed before the phenomenon of radiation zone. 예를들면 폴리에스테르 필름이 이러한 목적에 적합하다. For example, a polyester film is suitable for this purpose. 이 보호필름은 현상도중 적어도 비-경화점에서 제거할 수 있거나 현상액에 용해되는 물질로 구성될 수 있다. The protective film is, at least during the non-development - can be removed from the curing point, or may be of a material that is dissolved in the developer. 이러한 목적에 적합한 물질은 예를들면 왁스, 폴리비닐알콜, 폴리포스페이트, 설탕 등이다. Materials for this purpose are, for example, waxes, polyvinyl alcohol, phosphates, sugar and the like. 본 발명의 조성물은 높은 광민감성을 갖는 광중합성층을 제공한다. The compositions of the present invention provides a photo-polymerization layer having a high light sensitivity. 이것은 산소에 대하여 스크린으로 작용하는 보호층이 없는 경우이다. This is when there is no protective layer acting as a screen against oxygen. 보호층이 없어도 이층은 알칼리성 현상액 및 산 알콜성 세척액에 노출된 상태에서도 안정하며 점착성을 갖고 있지 않다. Without a bi-layer protective layer it is stable even in a state exposed to alkali developer and an acid alcoholic cleaning solution and does not have a tackiness. 또한, 폴리글리콜 단위를 가진 신규의 중합성 우레탄은 현상액 내성에 역효과를 미치지 않고 수용성/알칼리성 현상을 촉진시킨다. In addition, the polymeric urethanes of the new unit with the polyglycol does not adversely affect the developing solution resistance and facilitates the aqueous / alkaline developer. 그러한 중합성 우레탄을 함유하는 광중합성 층을 갖는 인쇄판을 현상액으로 채운 셀에 침지시키므로써 현상시킬 수 있다. Because immersing the printing plate having a photopolymerizable layer containing such the polymerizable urethane filled in a cell with a developing solution may be spent phenomenon. 본 발명의 조성물을 사용하여 광민감성 물질을 제조하는 것은 공지된 방법으로 수행한다. The prepared light-sensitive material using the compositions of the present invention will be carried out by known methods. 따라서, 조성물을 용매에 용해하고 용액 또는 분산액을 붓고, 분사하고, 침지하거나 또는 롤러를 사용하여 도포함으로써 지지체상에 필름으로서 적용할 수 있고, 이어서 건조시킬 수 있다. Thus, the poured into a dissolved in a solvent and the solution or dispersion composition, it is possible to injection, apply a dipping roller or film on a substrate by coating using, then can be dried. 이러한 종류의 지지체는 광민감성 물질의 목적하는 용도에 좌우된다. This type of support will depend on the intended use of the light-sensitive material. 평편한 인쇄판을 제조하기 위하여 바람직하게는 양극산화에 의하여 생성된 다공성옥사이드층을 운반하는 알루미늄이 일반적으로 사용된다. Preferably to manufacture a flat printing plate is of aluminum carrying a porous oxide layer produced by anodic oxidation is generally used. 알루미늄은 양극산화 공정전에 기계적으로, 화학적으로 또는 전기분해적으로 거칠게 하는 것이 유리하다. Aluminum is advantageously roughened mechanically, chemically or electrolytic pirate before anodization process. 양극 산화공정은 예를들면 바람직하게는 층중량이 0.5 내지 10g/m 2 인 옥사이드층을 얻을 수 있는 조건하에, 황산 및/또는 인산중에서 공지된 방법에 의해 수행된다. Anodizing process, for example, preferably under conditions that the layer weight can be obtained in an amount of 0.5 to 10g / m 2 of an oxide layer, it is carried out by methods known from the sulfuric and / or phosphoric acid. 광-민감성 층을 적용하기전에 예를 들면 실리케이트 또는 폴리비닐 포스폰산을 이용하여 인쇄특성, 특히 친수성을 증가시키기 위하여 옥사이드층을 전처리하는 것이 유리하다. Light - it is advantageous, for example, prior to applying the sensitive layer using silicate or polyvinyl phosphonic acid to pre-treatment the oxide layer in order to increase the printing characteristics, particularly hydrophilic. 알루미늄과 알루미늄합금 이외에, 철, 아연, 구리, 니켈, 크롬-도금된 철 또는 크롬-도금된 구리, 실리콘에서 분리시키거나 열성장시킨 실리콘 디옥사이드층, 또는 도우프된 옥사이드층, 폴리에틸렌 테레프탈레이트 또는 셀룰로오스 아세테이트로 구성된 플라스틱 필름 도는 펄론게이지(perlon gauze) 또는 니켈체와 같은 체인쇄 지지체등이 사용될 수 있다. In addition to aluminum and aluminum alloy, iron, zinc, copper, nickel, chrome-plated steel or chromium-plated copper, silicon dioxide layer in which to separate from the silicon or thermally grown, or to help profile the oxide layer, a polyethylene terephthalate or cellulose turning plastic film consisting of acetate and the like can be used as the support body printing peolron gauge (perlon gauze) or nickel body. 예를들면 투명한 원상을 사용하여 접촉노출시키는 것과 같은 공지된 방법에 의하여 상은 복사물질상에 생성된다. For example, by known methods such as by contact exposure using a transparent original state image is generated on the copied material. 탄소아크램프, 크세논램프, 금속할라이드로 도우프된 수은 고압램프와 같은 통상적인 광원이 이러한 목적을 위하여 사용된다. The conventional light source such as a carbon arc lamp, a xenon lamp, a high pressure mercury lamp to help profile the metal halide is used for this purpose. 상은 아르곤 이온 레이저와 같은 레이저광을 사용하여 생성시킬 수 있다. Phase can be generated using laser light such as argon ion laser. 노출된 복사물질의 현상은 현상액으로 노출되지 않은 층의 부분을 세척하므로써 공지된 방법에 의하여 수행한다. Developing the exposed copy material is carried out by methods known By cleaning the portions of the layer not exposed with a developing solution. 현상액의 조성은 광 민감성 층의 특성과 용해도에 의존한다. The composition of the developer will depend on the nature and solubility of the photosensitive layer. 적합한 현상액은 소량의 유기용매 또는 습윤제를 함유할 수 있는 유기용매 또는 용매 혼합물, 물 및 특히 알칼리금속 포스베이트 또는 실리케이트, 유기용매, 습윤제, 염료 및 다른 통상적인 첨가제와 같은 완충염을 함유할 수 있는 알칼리성 수용액이다. Suitable developing solution which may contain a buffer salt, such as a small amount of an organic solvent or wetting agents an organic solvent or solvent mixture, water, and in particular alkali metal phosphine bait or silicates, organic solvents, wetting agents, dyes and other conventional additives which may contain an alkaline aqueous solution. 유기용매를 함유하지 않는 현상액이 바람직하다. The developing solution containing no organic solvent is added. 본 발명의 조성물은 오프셋 인쇄판의 광기계학적인 제조를 위하여 적합한 지지체상의 에비감광화된 복사물질의 형태가 특히 적합하다. The compositions of the present invention in the form of an EV photosensitizing copy material on a suitable support for the preparation of offset printing plates mechanistic light is particularly suitable. 이들은 또한 내건성 필름, 양각상, 체인쇄형판 및 색-시험 필름을 제조하는데 적합하여 내액성으로 사용하는 것도 가능하다. They also naegeonseong film, embossed image, and color body stenciled-suited to the manufacture of the test films, it is possible to use the liquid within. 또한 급속히 경화되는 피복조성물, 치아충진조성물 및 접착제로서 유용하며 열에 안정한 단단한 성형물을 제조하는데도 사용된다. Also useful as a coating composition, the dental filling composition and the adhesive to be cured rapidly, and is also used to prepare a stable solid shaped article to heat. 다음의 실시예는 본 발명의 조성물 및 이들의 광중합성 복사물질을 제조하기 위한 용도의 실시태양을 나타낸다. The following examples show the embodiment of the use for the preparation of compositions and photopolymerizable copying material of the present invention. 백분율 및 비율은 달리 명시되지 않는 한 중량 단위로 이해되어야 한다. Percentages and ratios are to be understood as a weight unit unless otherwise specified. 2g/m 2 의 옥사이드층을 가지며 폴리비닐포스폰산의 수용액으로 전처리된, 전기화학적으로 거칠게하고 양극산화시킨 알루미늄을 인쇄판의 지지체로서 사용한다. 2g / m 2 has an oxide layer of aluminum which uses a polyvinyl phosphonic acid in a pre-treatment with an aqueous solution, electrochemically roughened and anodized as the support of the printing plate. 상기 지지체는 하기물질로 구성된 용액을 사용하여 회전-피복시킨다. The support is rotated by using the solution consisting of material - is coated. 알칸올로 부분 에스테르화되고 평균 분자량 20,000이며 약 200의 산가를 갖는 스티렌/무수말레산 공중합체 2중량부, 하기에 기술된 디우레탄 2중량부, 9-페닐-아크리딘 0.125중량부 및 부탄올 25중량부와 부틸 아세테이트 12중량부 중에서 2,4-디니트로-6-클로로-벤젠 디아조늄 염과 2-메톡시-5-아세틸아미노-N-시아노에틸-N-하이드록시에틸-아닐린을 커플링시켜 수득된 청색염료 0.05중량부. 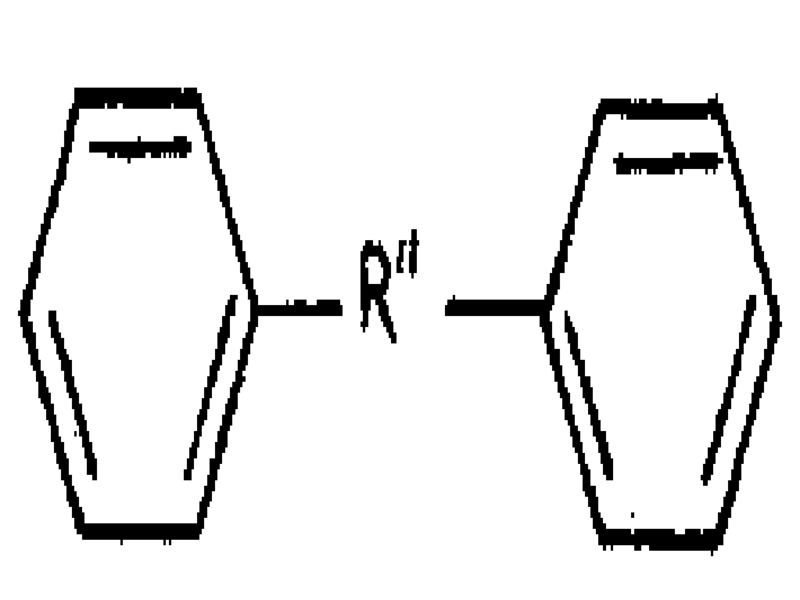 Chemistry partial esters with alkanols, and the average molecular weight of 20,000, and 2 parts by weight of the di-urethane described below, 2 parts by weight of a styrene / maleic anhydride copolymer having an acid number of about 200, 9-phenyl-acridine-butanol and 0.125 part by weight from 25 parts by weight and 12 parts by weight of butyl acetate, 2,4-dinitro-6-chloro-aniline - benzene diazonium salt and 2-methoxy-5-acetylamino--N- cyanoethyl -N- hydroxyethyl coupling to 0.05 parts by weight of a blue dye obtained. 판을 순환공기 건조 캐비넷중에서 100℃에서 2분간 건조시킨다. A plate at 100 ℃ in a circulating air drying cabinet and then dried for 2 minutes. 3.7 내지 4g/m 2 의 층중량이 수득된다. The layer weight of 3.7 to 4g / m 2 is obtained. 수득된 인쇄판은 5kW 금속할라이드 램프에 의하여 0.15 비율로 밀도가 증가하고 램프와 진공복사프레임과의 거리가 0cm인 13단계의 강도웨지하에 40초 동안 노출시킨다. The obtained printing plate is to increase the density to 0.15 percentage by 5kW metal halide lamp and exposed to wedge the strength of the lamp and in step 13 the distance of 0cm and vacuum copying frame for 40 seconds. 그후 판은 다음 조성을 갖는 현상액을 사용하여 수동으로 현상시킨다. Then plates are then developed with a manually using a developing solution having the following composition. 나트륨 메타실리케이트 X9 H 2 O 3.0중량%, 비이온성 습윤제(약 8개의 옥시에틸렌 단위를 갖는 코코낫 지방산 알코올 폴리옥시 에틸렌 에테르) 0.03중량부, 소포제 0.003중량부, 니트릴 로트리아세트산 0.02중량부, 스트론튬 클로라이드 X6 H 2 O 0.053중량부, 및 완전히 탈광화된 물 96,894중량부. Sodium metasilicate (coconut fatty alcohol polyoxyethylene ether having 8 oxyethylene units), 0.03 parts by weight of anti-foaming agent 0.003 parts by weight of nitrilotriacetic acid 0.02 parts by weight of strontium chloride X9 H 2 O 3.0% by weight of non-ionic wetting agent X6 H 2 O 0.053 part by weight, and fully de-mineralized water 96 894 parts by weight. 5개의 완전히 가교된 웨지 단계를 얻는다. To obtain the five completely crosslinked wedge step. 860.9g(10몰)의 메타크릴산, 21.4g의 벤질트리에틸 암모늄 클로라이드, 및 5g의 p-메톡시-페놀의 혼합물에 1282,5g(9몰)의 글리시딜 메타크릴산 에스테를 3시간 동안 교반하면서 75 내지 85℃에서 적가한다. Glycidyl methacrylate acid ester to 3 hours of 1282,5g (9 mol) to a mixture of phenol - 860.9g (10 moles) of methacrylic acid, p- methoxy 21.4g of benzyltriethylammonium chloride, and 5g during dropwise at 75 to 85 ℃ with stirring. 혼합물은 80℃에서 2시간 더 교반한 다음 용액을 묽은 중탄산나트륨 용액에 붓고 조금 교반한다. The mixture is poured into the solution, and then further stirred for 2 hours at 80 ℃ in dilute sodium bicarbonate solution and a little stirring. 유기상은 분리하여 다시 중탄산나트륨 용액으로 세척한다. The organic phase was separated and again washed with sodium bicarbonate solution. 생성물을 황산나트륨상에서 건조시키고 여과한 다음, 15g의 p-메톡시페놀에 의해 안정화시킨다. Dried, filtered and the product over sodium sulfate, and then, is stabilized by the p- methoxyphenol of 15g. 각각 약 150g의 소량을 0.07mbar 및 약 140℃의 욕온도에서 분별 증류한다. A small amount of about 150g each be fractionated at bath temperature of 0.07mbar and about 140 ℃. 비점(0.08mbar)은 115℃이며, 수율은 1541g으로 이론치의 75%이다. Boiling point (0.08mbar) is 115 ℃, the yield is 75% of theory with 1541g. 부분 중합화가 증류시 발생한다. Portion and polymerization is generated during the distillation. 먼저 336.4g(2몰)의 헥사메틸렌 디이소시아네이트 및 350g의 부타논중의 4g의 벤조퀴논을 교반기. A first agitator-benzoquinone of 4g of hexamethylene diisocyanate butanone and 350g of 336.4g (2 mol). CaCl 2 건조관을 가진 환류응축기 및 적하 깔때기가 장착된 3구 플라스크에 넣는다. Placed in a three-necked flask equipped with a reflux condenser and CaCl 2 drying tube fitted with a dropping funnel. 40ml의 부타논중의 0.06g의 트리에틸아민과 0.85g의 철(Ⅲ) 아세틸 아세토네이트로 구성된 촉매용액을 가한 다음, 900g의 부탄논중의 913g(4몰)의 글리세롤 디메타크릴산 에스테르를 80℃에서 2.5시간 동안 혼합물에 적가한다. Adding a catalyst solution consisting of triethylamine in 40ml of butanone 0.06g and 0.85g iron (Ⅲ) acetylacetonate and then the glycerol di-methacrylate ester of 913g (4 moles) of butane in the non 900g at 80 ℃ was added dropwise to the mixture for 2.5 hours. 혼합물을 80℃에서 2시간 더 교반한 다음 8ml의 에탄올을 가하고, 혼합물을 다시 80℃에서 1시간 동안 교반한다. The mixture was stirred for 2 hours at 80 ℃ The following was added to 8ml of ethanol, and the mixture is stirred again at 80 ℃ for 1 hour. 부타논중의 약 50% 농도의 디우레탄용액을 피복용액 제조에 직접 사용한다. The di-urethane solution of about 50% concentration of butanone are used directly in the production coating solution. 평균 입자크기 8㎛인 0.04중량부의 무정형 다공성 규산을 실시예 1에서 수득된 피복용액에 가한 다음, 4g/m 2 의 층중량이 수득될 정도로 이 혼합물을 사용하여 지지체를 회전-피복한다. The average particle size of 0.04 wt 8㎛ rotating the support with the mixture of amorphous porous silica embodiment added to the coating solution obtained in Example 1, to such an extent that the next, 4g of / m 2 layer weight to give negative - is covered. 판은 실시예 1과 동일한 방법으로 추가처리한다. Board is further processed in the same manner as in Example 1. 5개의 완전히 가교된 웨지단계를 얻는다. To obtain the five completely crosslinked wedge step. 인쇄판으로 통상적인 댐핑유니트(damping unit)에서 170,000장의 인쇄물을, 알코올 댐핑유니트에서는 70,000장의 인쇄물을 수득한다. The 170,000 sheets of printed matter in the conventional damping unit (damping unit) in the printing plate, the damping unit, to obtain the alcohol 70,000 prints. 다음 물질로 부터 피복용액을 제조한다 : 분자량 30,000이고 산가 117의 메틸-메타크릴산 에스테르/메타크릴산 공중합체 1중량부, 실시예 1에서 수득된 공중합체 1중량부, 2몰의 글리세롤 디메타크릴산 에스테르와 1몰의 2,2,4-트리메틸-헥사메틸렌 디이소시아네이트로 부터 수득된 디우레탄 2중량부, 9-페닐-아크리닌 0.125중량부, 실시예 1에 나타낸 염료 0.07중량부 및 부타논 28중량부와 부틸아세테이트 12중량부중의 실시예 2에 나타낸 규산 0.04중량부. To prepare a coating solution from the following materials: molecular weight 30,000 and acid value 117 methyl-methacrylic acid ester / methacrylic acid copolymer 1 part by weight, the embodiment of the copolymer obtained from 11 parts by weight of 2 mol glycerol dimethacrylate methacrylic acid ester with one mole of 2,2,4-trimethyl-hexamethylene diisocyanate, a di-urethane obtained from 2 parts by weight of 9-phenyl-acridine non 0.125 parts by weight of the dye of example 1 0.07 parts by weight shown in section, and 0.04 parts by weight of silicate shown in butanone to 28 parts by weight as in example 2, 12 parts by weight of butyl acetate bujung. 실시예 1에 기술한 알루미늄 지지체를 상기 용액으로 회전-피복하여 건조층 중량이 5g/m 2 이 되도록 한다. Examples 1 to rotate the described aluminum support in the solution in-coating layer was dried so that a weight of a 5g / m 2. 노출, 현상 및 평가는 실시예 1과 같이 수행한다. Exposure, development, and evaluation is carried out as in Example 1. 4개의 완전히 가교된 웨지단계를 얻는다. To obtain a four completely crosslinked wedge step. 실시예 1에 나타낸 지지체를 다음 조성의 용액으로 회전 피복하여 건조후 층중량이 1.8g/m 2 이 되도록 한다. Examples of the support shown in Figure 1 after the rotation coating drying a solution of the following composition by weight of this layer is to be 1.8g / m 2. 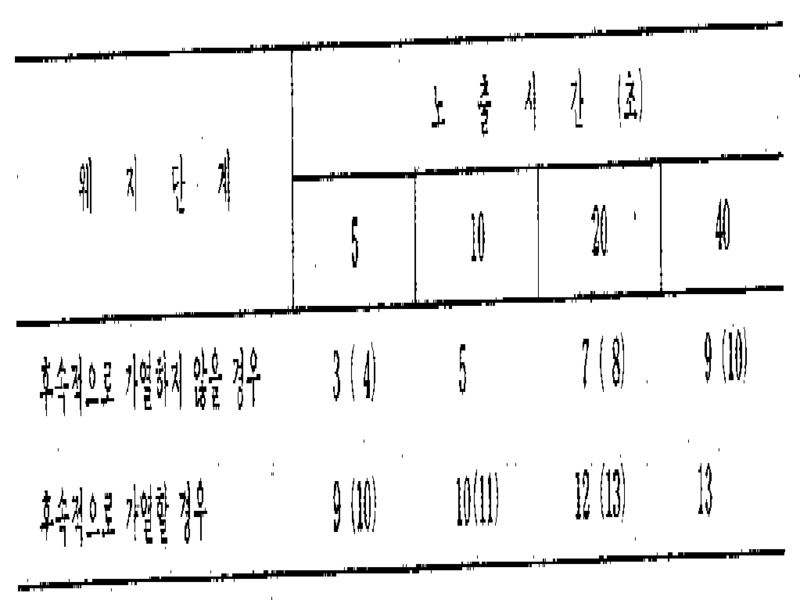 실시예 1에 나타낸 공중합체 2중량부, 하기에 기술된 올리고우레탄 1.6중량부, 9-페닐-아크리딘 0.5중량부 및 부타논 25중량부, 부틸아세테이트 12중량부와 에틸렌글리콜 모노메틸에테르 20중량부중의 실시예 1에 나타낸 염료 0.05중량부, 노출 및 현상은 실시예 1과 같이 수행한다. Example 1 2 parts by weight of copolymer shown in, up to the 1.6 parts by weight of polyurethane technology, a 9-phenyl-acridine-butanone and 0.5 parts by weight 25 parts by weight, butyl acetate 12 parts by weight of ethylene glycol monomethyl ether 20 dye 0.05 parts by weight, exposure and development as shown in the first embodiment of the weight bujung is carried out as in example 1. 7개의 완전히 가교된 웨지단계를 얻는다. To obtain a seven fully crosslinked wedge step. 현상셀에서 인쇄판을 현상시키는 것도 가능하다. Phenomenon is also possible to develop the printing plates in the cell. 이러한 목적을 위해, 노출후, 실시에 1에 기술된 현상액으로 충진된 셀중에 인쇄판을 매단다. For this purpose, the printing plate suspended in the filled cells in the developing solution described in the first post-exposure, performed. 판은 약 2분 후에 현상된다. Plate is developed after about 2 minutes. 물로 분무시켜야 한다. It should be sprayed with water. 먼저 660g의 부타논중의 336.4g(2몰)의 헥사메틸렌 디이소시아네이트를 교반기, 건조관을 가진 환류응축기, 및 적하깔때기가 장착된 3구 플라스크에 넣는다. First placed in a reflux condenser, and a dropping funnel with a stirrer, a drying tube of hexamethylene diisocyanate in the butanone of 660g 336.4g (2 mol) of 3-neck flask fitted. 다음 물질로 구성되고 촉매로 작용하는 혼합물에 가한다 : 철(Ⅲ) 아세틸아세토네이트 0.07g 및 부타논 5ml중의 트리에틸아민 0.005g. The following is a mixture composed of a material and acts as a catalyst: iron (Ⅲ) acetylacetonate and 0.07g butanone 0.005g triethylamine in 5ml. 그후 330g의 부타논에 용해된 400g(1몰)의 폴리에틸렌 글리콜 400을 1.5시간 동안 70℃에서 혼합물에 적가한다. It is then added dropwise and polyethylene glycol 400 in a 400g (1 mol) dissolved in butanone 330g of the mixture at 70 ℃ for 1.5 hours. 혼합물을 2시간 동안 70℃로 가온한다. The mixture was warmed to 70 ℃ for 2 hours. 4g의 벤조퀴논과 상술한 5ml의 촉매용액을 혼합물에 가하고, 실시예 1에 기술된, 330g의 부타논중의 456.5g(2몰)의 글리세롤 디메타크릴산 에스테르의 용액을 1시간 동안 70℃에서 적가한다. While putting the benzo quinone catalyst solution of the above mixture in 5ml of 4g, Example 1, a solution of glycerol di-methacrylate ester of 456.5g (2 mol) of butanone for 1 hour technical 330g in 70 ℃ It was added dropwise at. 첨가 후, 혼합물은 70℃에서 2.5시간 동안 추가로 교반한 다음, 20ml의 에탄올을 가하고, 혼합물은 70℃에서 1시간 동안 다시 가열한다. After the addition, the mixture was stirred further at 70 ℃ for 2.5 hours and then added to 20ml of ethanol, the mixture is heated again for one hour at 70 ℃. 용매를 증류시킨 다음, 혼합물은 5ℓ의 물로 진탕시켜 추출한다. The solvent was distilled off, then the mixture is extracted by shaking in 5ℓ of water. 에틸산의 형성은 약 200ml의 15% Nacl 용액을 가하므로써 방지할 수 있다. Formation of ethyl acid can be prevented, by applying a 15% Nacl solution of about 200ml. 혼합물을 500ml 에틸 아세테이트에 용해한 후, 다시 5ℓ의 물로 세척한다. The mixture was dissolved in 500ml of ethyl acetate, and again washed with 5ℓ of water. 유기상을 분리시키고, 추가의 2.1ℓ의 에틸 아세테이트로 희석한 다음 황산나트륨 상에서 건조시킨다. The organic phase was separated, diluted with ethyl acetate and 2.1ℓ of more then dried over sodium sulfate. 1.4ℓ의 가솔린(비점 40 내지 80℃)을 가하여 유상생성물을 침전시키고 이 생성물은 2ℓ의 에틸 아세테이트에 용해하여 다시 1.1ℓ의 가솔린으로 침전시킨다. It was added to 1.4ℓ of petrol (boiling point: 40 to 80 ℃) precipitated an oily product was the product was then re-precipitated with gasoline of 1.1ℓ was dissolved in ethyl acetate 2ℓ. 2.4g(약 0.3%)의 p-메톡시페놀로 안정화시킨 후, 남아있는 용액은 약 40℃의 욕온도에서 제거시킨다. Was stabilized with p- methoxyphenol, remain in solution of 2.4g (0.3%) are then removed from the bath temperature of about 40 ℃. 수율 : 674g=이론치의 56.5% 수득된 생성물의 분자량분포는 대조용으로서 실시예 1에 기술된 디우레탄에 대하여 겔 크로마토그래피에 의해 측정한다. Yield: 674g = 56.5% The molecular weight distribution of the obtained product of the theoretical value is determined by gel chromatography with respect to the di-urethane described in Example 1 as a to-be-verified. 평가하여 4개의 우레탄 그룹을 갖는 동족체에 대해 약 15%, 6개의 우레탄 그룹을 갖는 동촉체에 대해 약 24% 및 6개 이상의 우레탄 그룹을 갖는 동족체에 대해 약 58.5%의 비율을 얻는다. Evaluated by about 15% with respect to the analogs having four urethane groups to obtain a rate of about 58.5% to about 24%, and analogs having 6 or more urethane groups for dongchok body having six urethane group. 실시예 4에서와 같이 피복된 판이 건조 후 4g/m 2 의 폴리비닐알코올층을 갖도록 한다. Carried out as in Example 4 coated plates to have a polyvinyl alcohol layer, after drying 4g / m 2. 이판의 샘픔을 각 경우에 금속할라이드 램프를 사용하여 밀도가 0.15의 비율로 증가하는 13단계의 강도웨지하에 5, 10, 20, 또는 40초 동안 노출시킨 후, 실시예 1에 기술된 현상용액을 사용하여 현상한다. Using a metal halide lamp the backing saempeum in each case under the strength of a wedge of 13 steps of density increases in the ratio of 0.15 was exposed for 5, 10, 20, or 40 seconds, the developing solution described in Example 1 the developing use. 추가의 실험에서, 동일판의 샘플을 노출시킨 다음, 순환공기 건조 캐비넷에서 100℃에서 5초 동안 가열한 다음 현상시킨다. In a further experiment, the one exposing the sample of the same plate, and then heated in a circulating air drying cabinet at 100 ℃ for 5 seconds and then developed. 다음, 표는 층이 상반되는 특성을 가지고 있으며, 잇따른 가열단계는 완전히 가교된 웨지단계를 상당히 증가시킴을 보여준다. Next, the table has a characteristic in which the layer is opposite, and shows the subsequent heating step significantly increases the fully crosslinked wedge step. 거의 완전히 가교된 웨지단계의 수는 괄호안에 나타낸다. Almost completely the number of cross-linking step wedge represents in parentheses. 40초 동안 노출되고 보호층(9(10))을 갖는 인쇄판의 완전히 가교된 웨지단계를 보호층(7 : 실시예 4)을 갖지 않는 상응하는 판의 웨지단계와 비교하면 층은 산소에 대하여 민감성이 별로 없음을 알 수 있다. A fully cross-linked wedge steps of a printing plate having an exposed and a protective layer (9, 10) a 40 second protective layer (7: Example 4) compared to the corresponding plate of the wedge step which does not have the layer is sensitive with respect to the oxygen this can be seen by none. 다른 단량체(예를들면 트리메틸올에탄 트리아크릴산 에스테르)를 갖는 층은 산소의 작용하에서는 (즉 보호층 없이)보호층이 있는 경우보다 훨씬 적게 가교한다. Layer with another monomer (for example, trimethylolethane acrylic acid ester) is much less cross-linked than in the case with a protected under the action of oxygen (i.e., without a protective layer) layer. (40초의 노출시간동안 보호층이 없는 경우는 4개의 웨지단계이며 보호층이 있는 경우는 9개의 웨지단계이다.). (If there is no protective layer for 40 seconds exposure time it is four wedges step and if the protective layer is a nine step wedge). 실시예 1의 지지체를 다음 조성을 갖는 용액으로 회전-피복하여 건조 후 층중량이 2.5g/m 2 이 되도록 한다 : 실시에 1에 나타낸 공중합체 2중량부, 다음 (a) 내지 (f)의 화합물중 하나 1.6중량부 a) 2몰의 글리세롤 디메타크릴산 에스테르, 2몰의 헥사메틸렌 디이소시아네이트 및 1몰의 폴리에틸렌글리콜 200으로 부터 수득된 올리고우레탄, b) 1몰의 폴리에틸렌 글리콜 300을 갖는 올리고우레탄 동족체, c) 1몰의 폴리에틸렌글리콜600을 갖는 올리고우레탄 동족체, d) 1몰의폴리에틸렌 글리콜 1000을 갖는 올리고우레탄 동족체, e) 1몰의 디프로필렌 글리콜을 갖는 올리고우레탄 동족체, f) 1몰의 폴리프로필렌 글리콜 400을 갖는 올리고우레탄 동족체, 9-페닐-아크리딘 0.5중량부 및 부타논 23중량부, 부틸아세테이트 12중량부 및 에틸렌 글리콜 모노메틸에테르 12중량부중의 Example 1 rotation of the support in a solution having the following composition - such that the coating weight of the layer 2.5g / m 2 and then dried to: copolymer 2 parts by weight shown in the first embodiment, the compounds of the following (a) to (f) of a 1.6 parts by weight of a) 2 mol of glycerol di-methacrylate ester, an oligonucleotide obtained from hexamethylene a diisocyanate and one mole of polyethylene glycol 200 2 moles of an oligonucleotide having a urethane, b) 1 mol of polyethylene glycol 300 PU analogs, c) an oligonucleotide having a polyethylene glycol 600 1 mol of urethane analogs, d) an oligonucleotide having a one mole of polyethylene glycol 1000 urethane analogs, e) an oligonucleotide having a dipropylene glycol of 1 mol of the urethane analogs, f) poly 1 mole of oligonucleotide analogues having polyurethane, propylene glycol 400, 9-phenyl-acridine-butanone and 0.5 parts by weight 23 parts by weight, butyl acetate 12 parts by weight of ethylene glycol monomethyl ether 12 parts by weight bujung 실시예 1의 아조염료 0.05중량부. 0.05 parts by weight of the azo dye of the exemplary example 1. 판을 40초 동안 노출시키고, 실시예 1의 현상액 용액에서 현상시킨다. The plate was exposed for 40 seconds, the developing solution in the developing solution of Example 1. 다음의 완전히 가교된 웨지 단계를 얻는다. Obtained the following completely the cross-linking step of the wedge. 피복 용액을 다음 물질로 부터 제조한다 : 실시예 1에 나타낸 공중합체 2중량부, 다음 (a) 내지 (f)의 단량체중 하나 2중량부 a)2,2-비스-[4-(2-아크릴로일옥시-프로폭시)-페닐]프로판, b) 트리메틸올에탄 트리아크릴산 에스테르, c) 1몰의 2,2,4-트리메틸-헥사메틸렌 디이소시아네이트와 2몰의 하이드록시에틸 메타크릴산 에스테르와의 반응생성물, d) 1몰의 트리에틸렌 글리콜, 2몰의 2,2,4-트리메틸-헥사메틸렌 디이소시아네이트와 2몰의 하이드록시에틸 메타크릴산 에스테르와의 반응생성물, e) 실시예 1의 디우레탄, f) 실시예 4의 올리고우레탄, 9-페닐-아크리딘 0.125중량부 및 부타논 27중량부와 부틸 아세테이트 12중량부 중의 실시예 1의 아조염료 0.05중량부. The coating solution is prepared from the following ingredients: Example 1 2 parts by weight of copolymer shown in, the following (a) to (f) 2 parts by weight of one of the monomers a) 2,2- bis - [4- (2 acryloyloxy-propoxy) -phenyl] propane, b) trimethylolethane acrylic esters, c) one mole of 2,2,4-trimethyl-hexamethylene diisocyanate and hydroxyethyl methacrylate ester of a 2 mol with the reaction product, d) 1 mole of triethylene glycol, 2 moles of 2,2,4-trimethyl-hexamethylene diisocyanate with 2 mol of hydroxyethyl methacrylate the reaction products of the ester, e) of example 1 of di-urethane, f) example 4 oligo urethane, a 9-phenyl-acridine 0.125 parts by weight of butanone 27 weight parts of butyl acetate 0.05 parts by weight of the azo dye of example 1 in 12 parts by weight. 전기적으로 거칠게하고 양극 산화된 알루미늄을 상기 용액으로 회전-피복하여 건조층 중량이 3.5g/m 2 이 되게 한다. Electrically roughened and anode oxidized aluminum rotated in the solution-coated to the dry layer weight is to be 3.5g / m 2. 판을 10, 20 및 40 초 동안 노출시키고, 실시예 1에 나타낸 현상액으로 90초 동안 수동으로 현상시킨다. The plate 10, and exposed for 20 and 40 seconds, in Example 1, thereby manually developed with a developing solution for 90 seconds as shown in. 또다른 실험에서 판을 순환공기건조 캐비넷에서 100℃에서 1시간 동안 저장한 후, 40초 동안 노출시킨 다음 90초 동안 형상한다. It was again after storage for 1 hour, the plate in the different experiments at 100 ℃ in a circulating air drying cabinet, exposed for 40 seconds to 90 seconds, and then shaped. 그 결과는 다음 표에 요약되어 있다. 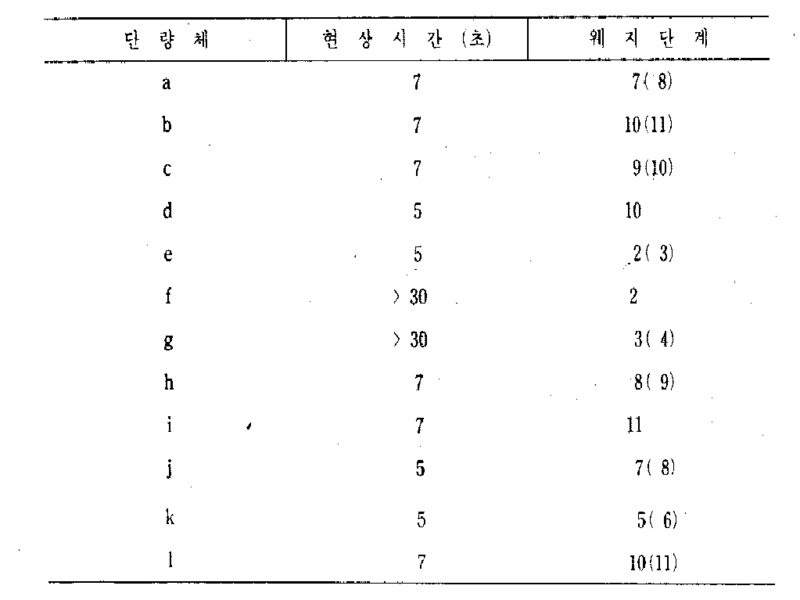 The results are summarized in the following table. 4개의 대조용 단량체는 기재된 화합물(e,f)에 비하여 현상시간과 상호성 및 휘발성(100℃시험)의 관점에서 모두 단점을 나타냄을 명백히 알 수 있다. 4-verified monomers may be apparent to represent all the disadvantages in terms of described compound (e, f) developing time, and the volatile and reciprocity (100 ℃ test) compared to. 두께 25㎛의 양축으로 연신되고 열고정된 폴리에틸렌 테레프탈레이트를 다음 조성의 용액으로 회전-피복시킨다. The biaxially stretched in the thickness and heat-setting rotational 25㎛ the polyethylene terephthalate with a solution of the following composition - is coated. n-헥실 메타크릴산 에스테르, 메타크릴산 및 스티렌(60 : 30 : 10)으로 이루어진 평균 분자량 약 35,000을 갖는 터폴리머 6.5중량부, 실시에 1에 기술된 디우레탄 5.6중량부, 9-페닐-아크리딘 0.2중량부 및 부타논 25중량부와 에탄올 3중량부중의 실시예 1의 아조염료 0.02중량부. n- hexyl methacrylate ester, methacrylic acid and styrene (60: 30: 10) terpolymer having the average molecular weight of approximately 35,000 consisting of 6.5 parts by weight of the di-urethane 5.6 parts by weight described in the first embodiment, 9-phenyl- acridine 0.2 parts by weight of butanone and 25 parts by weight of ethanol and 3 parts by weight 0.02 parts by weight of the azo dye of example 1 of bujung. 100℃에서 건조시킨 후, 33g/m 2 의 층중량을 얻는다. After drying at 100 ℃, to obtain a layer weight of 33g / m 2. 이와 같이 제조된 내건성 필름을 통상적인 적층장치를 사용하여 35㎛두께의 구리필름으로 지지된 적층 페노플라스트판상에 120℃에서 적층시킨 다음, 통상적인 노출장치로 20초 동안 노출시킨다. The naegeonseong film produced in this way using a conventional laminating device is exposed laminated at 120 ℃ the stacked phenothiazine plast plate supported by the 35㎛ thick copper film, and then, in a conventional exposure apparatus for 20 seconds. 선폭과 간격이 80㎛이하인 선을 그은 원본을 원본으로 사용한다. The line width and spacing, use the original drawn a line 80㎛ than the original. 노출 후에 폴리에스테르 필름을 제거하고 층은 실시예 1에 기술된 현상액 용액을 사용하여 분무 현상장치내에서 90초 동안 현상시킨다. After exposure remove the polyester film layer using a developer solution described in Example 1, then developed for 90 seconds in a spray developing device. 판은 수도물로 30초 동안 수세하고 15% 암모늄 퍼옥시디설페이트 용액에서 30초 동안 부식시키고, 다시 물로 수세한 다음 10% 황산에 30초 동안 침지시키고 계속해서 다음의 전해질 욕에서 전기도금시킨다. Plates by washing with water for 30 seconds with tap water and immersed in 15% ammonium peroxydisulfate solution and corroded for 30 seconds, again washed with water for 30 seconds in 10% sulfuric acid and then continues in the next electroplating bath of electrolyte. 판은 침투나 손상을 나타내지 않았다. Plates did not show penetration or damage. 50℃에서 5% KOH용액에서 판으로 부터 층을 제거하고 통상적인 부식매질중에서 노출된 구리를 부식시키는 것이 가능하다. Removing the layer at 50 ℃ in 5% KOH solution from the plate, and it is possible to corrosion of conventional copper corrosion from the exposed substrate. 이판도 역시 침투되거나 손상되지 않았으며 KOH 용액으로 층을 제거하고 통상적인 부식제로 판을 부식시키는 것이 가능하다. Yipando also did not penetrate or damage it is possible to remove the layer in KOH solution and corrosion of the plates by conventional caustic. 35㎛ 구리 피복된 절연물질로 구성된 깨끗한 지지체를 다음물질의 용액으로 회전-피복하여 건조층 두께가 4㎛로 되게한다 : 실시예 8에 나타낸 터폴리머 6.5중량부, 실시예 4의 올리고우레탄 5.6중량부, 9-페닐-아크리딘 0.2중량부 및 부타논 25중량부와 에탄올 3중량부중의 실시예 1의 아조염료 0.02중량부. Rotating the support configured to clean 35㎛ copper-coated insulating material with a solution of the following materials - it is covered by a dry layer thickness to be 4㎛: Example 8 shown in the terpolymer of 6.5 parts by weight Example 4 5.6 parts by weight of oligo urethane parts of 9-phenyl-acridine-butanone and 0.2 parts by weight 25 parts by weight of ethanol and 3 parts by weight 0.02 parts by weight of the azo dye of example 1 of bujung. 층은 순화공기건조 캐비넷에서 100℃에서 2분간 건조시킨다. Layer is dried for 2 minutes at 100 ℃ in purified air drying cabinet. 그후 층을 5kW 램프로 40초 동안 노출시킨다. Then the layer is exposed for 40 seconds to a 5kW lamp. 실시예 8에 기술된 선을 그은 원본을 원본으로서 사용한다. Embodiment uses the source as the source drawn a line described in Example 8. 노출 후, 판은 0.8% 탄산나트륨용액을 사용하여 45초 동안 분무가공액중에서 현상시킨다. After exposure, the plate is sprayed for 45 seconds with a 0.8% sodium carbonate solution and developer in a conjugate. 판을 세척하고 부식하며, 다음과 같이 전기도금한다. Washing the plate, and corrosion, and is electroplated as follows. 침투는 없었다. There was no penetration. 5% KOH 용액중에서 50℃에서 판으로 부터 층을 제거하고 통상적인 부식매질중에 노출된 구리를 부식하는 것이 가능하다. Removing the layer at 50 ℃ from the plate in a 5% KOH solution, and can be corrosive to conventional copper exposed to the corrosive medium. 실시예 1의 지지체를 다음 조성을 갖는 용액으로 회전-피복하여 층중량 2.2g/m 2 을 수득한다 : 스티렌/무수 말레산 공중합체 2중량부(1 : 1, 분자량 50,000), 하이드록시에틸 메타크릴산 에스테르와 반응함(반응생성물의 분자량 약 80,000), 2부의 다음 (a) 내지 (1)의 단량체중 하나 2중량부, a) 2몰의 글리세롤 디메타크릴산 에스테르와 1몰의 헥사메틸렌 디이소시아네이트로 부터 수득된 디우레탄, b) 2몰의 글리세롤 디메타크릴산 에스테르, 2몰의 헥사메틸렌 디이소시아네이트 및 1몰의 폴리테트라하이드로푸란디올로 부터 수득된 올리고우레탄(분자량 1000의 통상적인 제품), c) 2몰의 글리세롤 디메타크릴산 에스테르, 2몰의 헥사메틸렌 디이소시아네이트 및 1몰의 폴리 카프로락톤디올로 부터 수득된 올리고우레탄(분자량 830), d) 2몰의 글리세롤 디메타크릴산 에 Example 1 rotation of the support with the following composition having a solution-coated to give a layer weight of 2.2g / m 2: styrene / maleic acid copolymer 2 wt% (1: 1, molecular weight 50,000), hydroxyethyl methacrylate also react with ester (molecular weight of about 80,000 of the reaction product), one of the monomers of the 2 parts of the following (a) to (1) 2 parts by weight, a) 2 moles of glycerol di-methacrylate ester and 1 mole of hexamethylene isocyanate the di urethane, b) 2 moles of glycerol di-methacrylate ester, poly-tetrahydrofuran-diol the oligonucleotide polyurethane obtained from two moles of hexamethylene diisocyanate and 1 mole of (a conventional product having a molecular weight of 1000) obtained from the , c) an oligonucleotide obtained from a 2 mol glycerol dimethacrylate ester, hexamethylene diisocyanate and polycaprolactone diol of one mole of the two moles of urethane (molecular weight 830), d) a glycerol di-methacrylate, 2 moles of 테르, 2몰의 헥사메틸렌 디이소시아네이트 및 1몰의 폴리 에틸렌 글리콜 400으로 부터 수득된 올리고우레탄, e) 2몰의 글리세롤 디메타크릴산 에스테르, 2몰의 헥사메틸렌 디이소시아네이트 및 1몰의 4,4'-디하이드록시디페닐설폰으로 부터 수득되는 올리고우레탄, f) 1몰의 비스페놀 A를 가진 올리고우레탄 동족체, g) 1몰의 비스페놀 A와 2몰의 에틸렌옥사이드와의 반응생성물 1몰을 가진 올리고우레탄 동족체, h) 1몰의 비스페놀 A와 8몰의 에틸렌옥사이드와의 반응생성물 1몰을 가진 올리고우레탄 동족체, i) 1몰의 비스페놀 A와 16몰의 에틸렌옥사이드와의 반응생성물 1몰을 가진 올리고우레탄 동족체, j) 1몰의 글리시딜 메타크릴산 에스테르와 1몰의 아크릴산의 반응생성물 2몰과 1몰의 헥사메틸렌 디이소시아네이트로 부터 수득된 디우레탄, k) 2몰의 글리세 Termini, an oligonucleotide obtained from a polyethylene glycol 400, 2 moles of hexamethylene diisocyanate and 1 mole of polyurethane, e) two moles of glycerol di-methacrylate ester, 2 moles of hexamethylene diisocyanate and 1 mole of 4,4 '- di-hydroxyl CD phenyl oligonucleotide with oligo urethane, f) of bisphenol a, 1 mol obtained from the sulfonic up with the reaction product per 1 mol of the urethane analogs, g) bisphenol a 1 mole and 2 moles of ethylene oxide urethane analogs, h) up with the reaction product per 1 mol of the 1 mole of bisphenol a with 8 moles ethylene oxide up with the reaction product per 1 mol of the urethane analogs, i) bisphenol a, 1 mole and 16 moles ethylene oxide urethane analogs, j) when 1 mol of glycidyl meth dill obtained from the methacrylic acid ester with 1-hexamethylene of acrylic acid reaction product with 2 moles of diisocyanate and one mole of the mole of the di-urethane, k) two moles of glyceryl 디아크릴산 에스테르와 1몰의 헥사메틸렌 디이소시아네이트로 부터 수득된 디우레탄, l) 2몰의 톨일렌 디이소시아네이트와 1몰의 폴리테트라하이드로푸란디올의 반응생성물 1몰과 2몰의 글리세롤 디메타크릴산 에스테르로 부터 수득된 테트라우레탄(분자량 약 2000), 9-페닐-아크리딘 0.7중량부, 실시예 1에 나타낸 아조염료 0.07중량부, 부타논 32중량부, 부틸아세테이트 12중량부 및 에틸렌글리콜 모노메틸 에테르 12중량부, 판을 실시예 1에서와 같이 40초 동안 노출시킨 다음, 실시예 1에서 주어진 현상액 용액으로 현상시킨다. Di obtained from hexamethylene diisocyanate of acrylic ester and one mole of di-urethane, l) of two moles of tall ylene diisocyanate with 1 mole of poly-tetrahydrofuran-diol in the reaction product per 1 mol and 2 mol glycerol dimethacrylate acid the urethane tetra (molecular weight of about 2000) obtained from the esters, 9-phenyl-acridine azo dye shown in 0.7 part by weight in example 1, a Dean 0.07 parts by weight of butanone 32 weight parts of butyl acetate and 12 parts by weight of ethylene glycol monomethyl ether then developed with a developer solution in the exposed and then given in example 1 for 40 seconds, such as from 12 parts by weight, and subjected to plate example 1. 웨지단계수와 현상시간은 다음 표에 나타내었다. 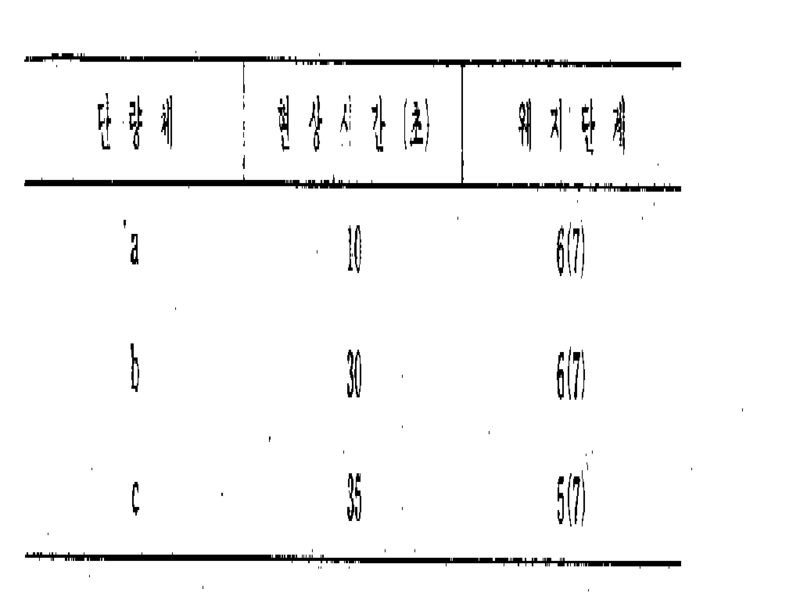 Wedge step number and processing time are shown in the following table. 실시예 11에 나타낸 결합제를 스티렌/모노알킬 말레이트 공중합체(분자량~64,000)로 대체시키고, 다른 처방은 동일하게 하면, 실시예 11의 단량체 a에 대하여 6(7)의 완전히 가교된 웨지단계를 얻고 단량체 c에 대하여는 8(9)의 완전히 가교된 웨지단계를 얻는다. Embodiment and replacing the binder shown in Example 11 styrene / monoalkyl maleate copolymer (molecular weight ~ 64,000), the fully cross-linked wedge steps of 6 (7) with respect to monomer a in the other regimen when the same, Example 11 gain to obtain a fully crosslinked wedge steps of the 8 (9) with respect to the monomer c. 현상시간은 두 경우에 5초보다 짧았다. The development time is shorter than 5 seconds in both cases. 다음 조성의 피복용액을 제조하여 전기적으로 거칠게하고 양극 산화시킨 알루미늄상에 회전-피복시켜 건조 후 층중량이 2.5g/m 2 이 되게 한다 : 실시예 1에 주어진 공중합체 1.6중량부, 산가 약 260의 메틸비닐에테르와 말레산 모노부틸 에스테르와의중합체 0.4중량부, 다음 (a) 내지 (c)의 단량체 중 하나 2중량부, a) 2몰의 글리세롤 디메타크릴산 에스테르와 1몰의 헥사메틸렌 디이소시아네이트와의 반응생성물, b) 3몰의 글리세롤 디메타크릴산 에스테르, 3몰의 헥사메틸렌 디이소시아네이트 및 1몰의 트리메틸올 에탄의 반응생성물, c) 3몰의 글리세롤 디메타크릴산 에스테르, 3몰의 헥사메틸렌 디이소시아네이트 및 1몰의 트리메틸올프로판의 반응생성물, 9-페닐-아크리딘 0.7중량부, 부타논 30중량부, 부틸 아세테이트 12중량부 및 에틸렌글리콜 모노메틸 에테 Electrically roughened by preparing a coating solution of the following composition, and rotation on the anode was of aluminum oxide-coated and then dried to a layer to be the weight of 2.5g / m 2: exemplary copolymers as given in Example 1, 1.6 parts by weight, an acid value of 260 of methyl vinyl ether and polymer 0.4 parts by weight with maleic acid monobutyl ester, the following (a) to (c) one or two parts by weight of the monomer of, a) 2 moles of glycerol di-methacrylate ester and 1 mole of hexamethylene the reaction product of a diisocyanate, b) 3 moles of glycerol di-methacrylate ester, of 3 moles of hexamethylene diisocyanate and the reaction product of 1 trimethylolethane molar, c) the 3 mol glycerol dimethacrylate ester, 3 mol of hexamethylene diisocyanate and the reaction product of 1 mole of trimethylol propane, 9-phenyl-acridine 0.7 parts by weight of butanone, 30 parts by weight, butyl acetate 12 parts by weight of ethylene glycol monomethyl ethenyl 12중량부중의 실시예 1의 아조 염료 0.07중량부, 판을 40초 동안 노출시킨 다음 실시예 1에 나타낸 현상용액으로 현상시킨다. 12 in which the weight of exposure bujung Example 1 0.07 parts by weight of the azo dye, of a plate of 40 seconds and then developed with a developing solution thereby as shown in Example 1. 다음의 완전히 가교된 웨지단계의 수를 얻는다. It gets the number of the next completely crosslinked wedge steps. 1㎛ 두께의 실리콘 디옥사이드를 함유하는 실리콘 웨이퍼를 다음 조성의 피복 용액으로 회전-피복하여 80℃에서 10분간 건조한 후 1g/m 2 의 층중량을 수득한다. Rotating the silicon wafer comprising a silicon dioxide thickness of 1㎛ the coating solution of the following composition-coating will be dried at 80 ℃ 10 bungan give a layer weight of 1g / m 2. 실시예 8에 주어진 터폴리머 6.5중량부, 실시예 1의 디우레탄 5.0중량부, 9-페닐아크리딘 0.7중량부 및 부타는 30중량부 및 에틸렌글리콜 모노메틸에테르 28중량부중의 2,4-디니트로-6-클로로-벤젠-디아조늄염과 2-메톡시-5-아세틸아미노-N,N-디에틸아닐린을 커플링시켜 수득된 청색염료 0.125중량부. Example 8 given terpolymer 6.5 parts by weight of di-urethane of Example 1 to 5.0 parts by weight of 9-phenyl acridine 0.7 parts by weight of butadiene and 30 parts by weight and ethylene glycol monomethyl ether 28 parts by weight of 2,4-bujung dinitro-6-chloro-benzene-diazonium salt and 2-methoxy-5-acetylamino-a blue dye and 0.125 parts by weight is obtained by coupling the -N, N- diethylaniline. 노출장치를 이용하여 샘플을 1.5㎛ 이하의 구조를 갖는 시험원본을 통하여 6초 동안 노출시키고(조사강도 8.4mw/cm 2 ) 0.8% 탄산나트륨 용액에 45초 동안 현상시킨다. 1.5㎛ exposed samples using the exposure device through a test original having the following structure for 6 seconds and then developed (the irradiation intensity 8.4mw / cm 2) for 45 seconds in a 0.8% sodium carbonate solution. 그후 70g의 불화암모늄, 31ml의 40% 불화수소산, 및 105ml의 탈이온수의 혼합물중에서 23℃에서 10분간 부식시킨다. Then in ammonium fluoride, 40% hydrofluoric acid in 31ml, and 23 ℃ in a mixture of 105ml of deionized water 70g corrode for 10 minutes. 그후, 300ml의 98% 황산과 50ml의 35% 과산화수소 용액의 혼합물중에서 110℃에서 2분간 탈피복시킨다. Thereafter, the clothing break for 2 minutes at 110 ℃ from 98% to 35% mixture of hydrogen peroxide solution of sulfuric acid and 50ml of 300ml. 뚜렷한 변부를 가진 1.5㎛ 이하의 구조의 상을 얻는다. Distinct sides to obtain an image of the structure in which 1.5㎛ having an. a) 중합성 결합제, b) 방사선에 의해 활성화될 수 있는 중합개시제 및 c) 분자내에 적어도 2개의 우레탄 그룹을 갖는 다가 하이드록시 화합물의 아크릴산 에스테르 또는 메타크릴산 에스테르를 필수성분으로 함유하며 방사선에 의해 중합가능한 조성물에 있어서, 성분 C), 즉 아크릴산 에스테르 또는 메타크릴산 에스테르가 글리세롤 디메타크릴산 에스테르 또는 글리세롤 디아크릴산 에스테르와 2 내지 6개의 OH 그룹을 갖는 다가 하이드록시 화합물을 디이소시아네이트와 반응시켜 수득한 폴리이소시아네이트와의 반응 생성물, 또는 글리세롤 디메타크릴산 에스테르 또는 글리세롤 디아크릴산 에스테르와 디이소시아네이트와의 반응생성물임을 특징으로 하는 조성물. a) polymeric binder, b) a polymerization initiator which can be activated by radiation and c) contains at least two acrylic acid ester or methacrylic acid ester of a hydroxy compound polyvalent having one urethane group in the molecule as an essential component, and by the radiation polymerization in the compositions, component C), i.e., acrylic acid ester or methacrylic acid ester is glycerol dimethacrylate to methacrylic acid esters and glycerol di-acrylate ester and the hydroxy compound polyvalent having 2 to 6 OH groups is reacted with the diisocyanate to give a polyester reaction product of a diisocyanate, or glycerol dimethacrylate or glycerol di-ester composition as that characterized acrylate ester with a diisocyanate with the reaction product of. 제 1 항에 있어서, 다가 하이드록시 화합물이 다음 일반식중의 하나의 화합물임을 특징으로 하는, 방사선에 의해 중합가능한 조성물. According to claim 1, wherein the polyhydric hydroxyl compound is then characterized in that a compound of the general formula, the polymerizable composition by the radiation. -O-(C p H 2p -O-) n H, 상기식에서, R"는 0, S, CR 2 또는 SO 2 이고, Q는 페닐렌 그룹 또는 C q H 2q 또는 C q H 2q-2 그룹이며, R은 수소원자 또는 메틸 그룹이고, Z는 0 또는 NR이고, n은 0 내지 20의 정수이고, m은 1 내지 40의 정수이고, p는 2 내지 20의 정수이고, q는 2 내지 10의 정수이고, r은 4 내지 20의 정수이고, s은 2 내지 10의 정수이고, v는 0 내지 4의 정수이고, 단, p, q 및 s는 v보다 2이상 크고, r는 v보다 4이상 크다. -O- (C p H 2p -O-) n H, wherein R, R "is 0, S, CR 2, or an SO 2, Q is a phenylene group or a C q H 2q or C q H 2q-2 group and, R is a hydrogen atom or a methyl group, and Z is O or NR, n is an integer from 0 to 20, m is an integer from 1 to 40, p is an integer from 2 to 20, q is 2 to 10 is an integer, r is an integer from 4 to 20, s is an integer from 2 to 10, v is an integer from 0 to 4, provided that, p, q and s v than 2 or greater, r is 4 than v greater than. 제 1 항에 있어서, 에스테르가 2 내지 40개의 우레탄 그룹을 함유함을 특징으로 하는, 방사선에 의해 중합가능한 조성물. According to claim 1, wherein the ester is 2 to which is characterized by containing from 40 urethane group, the polymerizable composition by the radiation. 제 1 항에 있어서, 에스테르가 메타크릴산에스테르임을 특징으로 하는, 방사선에 의해 중합가능한 조성물. The method of claim 1 wherein the ester is a methacrylic acid ester, a polymerizable composition by the radiation, characterized in that. 제 1 항에 있어서, 디이소시아네이트가 일반식 OCN-X-NCO(여기서, X는 탄소수 2 내지 20의 탄화수소 라디칼이다)의 화합물임을 특징으로 하는, 방사선에 의해 중합가능한 조성물. The method of claim 1, wherein the diisocyanate has the formula OCN-X-NCO composition polymerizable by radiation, characterized in that the compound of formula (where, X is a hydrocarbon radical having 2 to 20 carbon atoms). NL1015471C2 (en) 2001-04-09 Organic anti-reflective polymer and method for producing the same.